Lighting audit software that streamlines your sales process from start to finish. We make lighting audits ridiculously easy. Lighting companies choose us to simplify data collection, proposals, and pipeline management. Powerful energy audit software in a simple, easy-to-use package. Simplify your lighting data collection process with an easy-to-use interface and LightBids’ smart search tools. Track your sales, measure your success, and get valuable insights on ways that your team can sell smarter. Leverage professional proposals and the most powerful energy savings calculator to win more jobs. LightBids is so much faster and easier to work with than the competitors. I just choose the lights, set the numbers, and LightBids handles everything else. The average return on investment for LightBids is very high because it saves so much time. 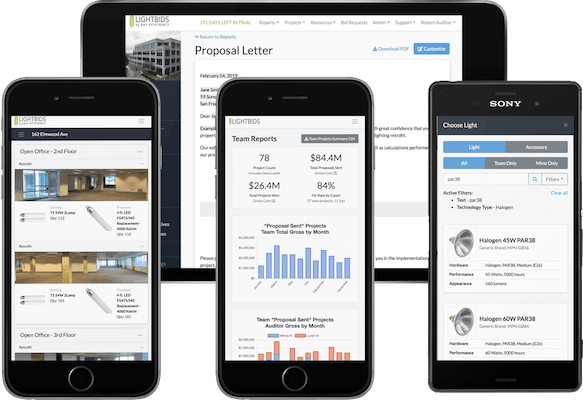 Cut your proposal cost by 50% and save an average of $625 per month per auditor by switching to LightBids. * Based on average customer savings for a 12 project/month auditor. The perfect plan to fit your organization's energy audit software needs. LightBids creates job-winning lighting proposals.